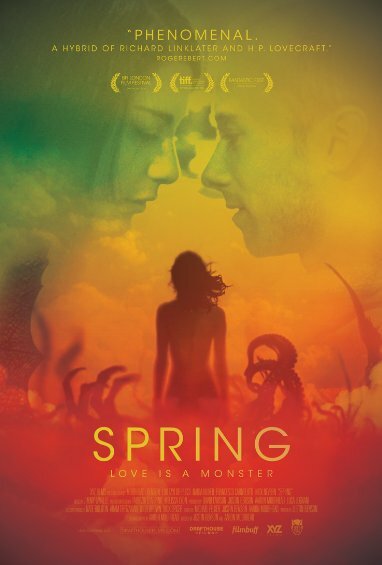 Spring is a little horror movie with a little hint of romance that does well enough to make the grade. It passes. Visually though, this is absolutely stunning, creatively using drones, static overhead shots, and photographing the streets and palisades of Italy with a technicolor haze. Like the title, the palette and cloudy atmosphere of the imagery creates a sense of renewal and awakening. What could that possibly be? In Spring, the story is about love, how sacrifice and acceptance aren’t just one time acts. They are evolutions, decisions that will help define the past and carry over into the next chapter. I’ve never seen something quite like this before, and while it falls apart in the convenient and imprudent ending, the movie will be a calling card for directors Justin Benson and Aaron Moorhead. A bright future in a dark genre seems to be brewing in their young careers. Spring is very much about the male relationship with women, guiding us along through the perspective of Evan (Lou Taylor Pucci). The powerful opening finds him sitting beside his sickly and dwindling mother. They talk, she dies, and it’s the kind of setup that proves to be haunting. Typical of death, the scene lingers with you. Evan is a Berkeley grad who came home to care for his mom. He shows promise but is comfortable at the bare bottom. After a violent outburst leaving one man beaten near death, and no family to speak of, Evan finally chooses to uproot his place of home and transplant his sense of self. Off to Italy he goes. He stays in hostels, meets some memorable European blokes on holiday, and is as touristy as they come. A first glimpse of the spellbinding Louise (Nadia Hilker) happens in love at first sight slow motion. This, as the shot choice explains, is a pivotal moment. One to be savored and remembered. They stumble upon each other again and again, she rejects him, he keeps asking to get her a drink. And finally she relents. Spring takes a sharp tonal shift about halfway through, right about the point where we learn Louise’s reluctant reasoning. It’s when the “horror” aspect comes into play. Pay no mind to that genre labeling because it is wrong. This isn’t a gory slasher flick or a picture full of deadly impending dread. It is science fiction with a primordial bend to the story. Horror movies place a heavy emphasis on the act of dying, literally or metaphorically. Spring is more unique than that. As the third act unfolds, we dive headfirst into scientific exposition and an exhausting amount of detail/reasoning. It’s not needed. And worse off, the choices made by the characters, and even their blossoming relationship, never comes together. Louise is put in a tough place and Evan represents a problem. A roadblock to a lifetime of springs. Nadia Hilker is convincing as the transformative Louise, but Pucci adds the bare minimum to an already indistinguishable character. Evan is not remarkable. Their love is not fate. The strength of Spring’s opening is weighed down by a burden of an ending. For a film about shared sacrifices, this is unequal, disproportionately so. Here is a movie that is neither as smart or direct as it thinks it is. Yet somehow, with the strangeness and the ambiguity and the other-worldliness to it, the film remains constantly engrossing and engaging. Benson and Moorhead direct the hell out of Benson’s suitable script, and the visual flair lights up what is an otherwise stagnant romance. Spring doesn’t blossom, but has an unusual ability to keep us hooked.